Straightness is included in the dressage rider’s schooling framework; the scales of training. 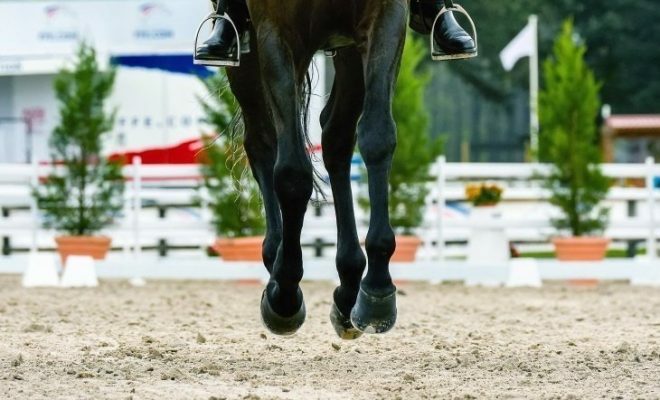 There are many exercises included in dressage tests that enable the judge to see if the horse moves straight or is crooked – center lines, for example. 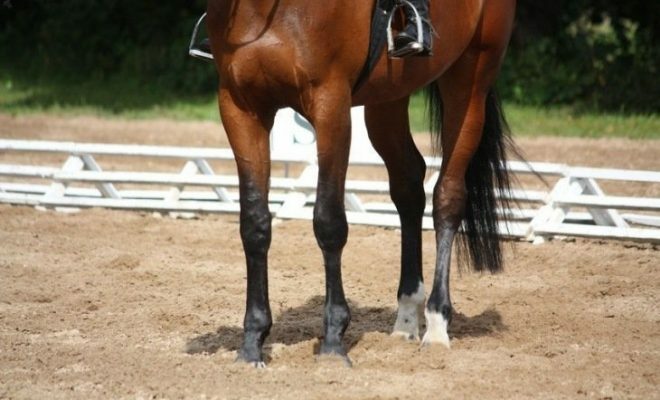 But how can you tell if your horse is crooked, and what can you do to make your horse straight? Horses are born naturally crooked in the same way that people are born left or right-handed. Through correct schooling, you are essentially seeking to make your horse ambidextrous, rather than one-sided. Why bother making your horse straight? Well, quite simply, a straight horse will produce better quality work and will be more coordinated and better balanced. A straight horse will move as if on railway tracks, regardless of whether he is describing a straight line, moving around a circle, or negotiating a turn. To check if your horse is straight, ride a center line in your arena, and look at the hoof prints your horse has left behind. You should be able to see two clear lines of parallel tracks; if your horse is crooked, you’ll see three. In the scales of training, you will see that straightness is quite a long way down the list. Why is this? Surely being straight would be something to teach the horse as soon as possible? Consider the preceding scales; rhythm, suppleness, contact and impulsion. 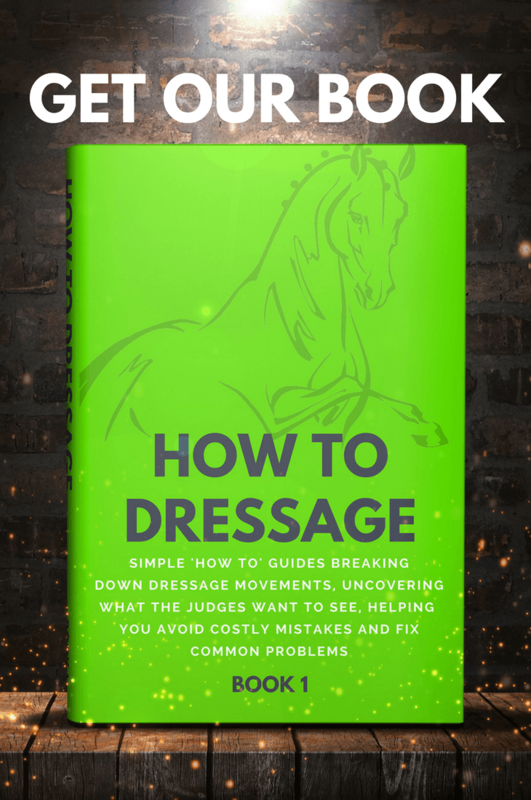 The correct rhythm in all paces for a dressage horse is paramount and should be established first. In that rhythm, the horse should swing through a supple back into an elastic even contact, and with active hindquarters. Only when the rider can achieve all these elements of the scales, can they make the horse straight. In walk, because the hindquarters are wider than the shoulders and the walk moves slowly, the horse can wiggle and crab. Keep the walk moving forward and encourage the horse to work into the contact. 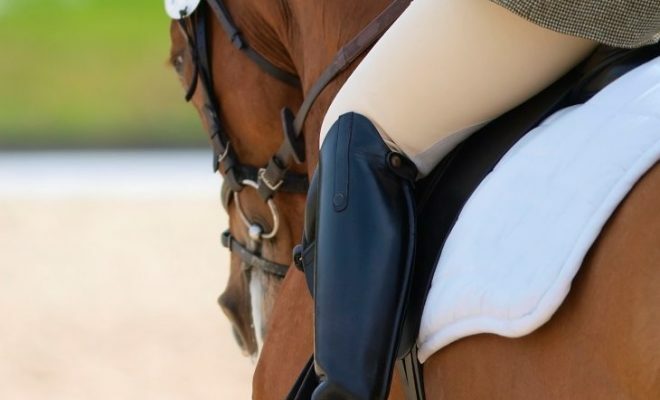 If the horse comes against the hand, this blocking action will cause the quarters to swing in, so make sure that the contact is light and remains elastic. Keep the horse’s neck straight; too much neck bend will cause the horse’s shoulder to bulge out. 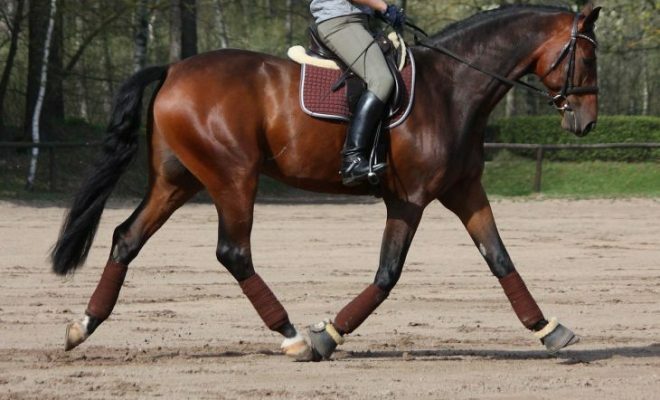 It can be easier to keep the horse straight in trot because it’s easier to ride him forward. First of all, make sure that you’re sitting straight and that your weight is evenly distributed over your seat bones. You can’t expect your horse to stay straight if you’re sitting to one side! 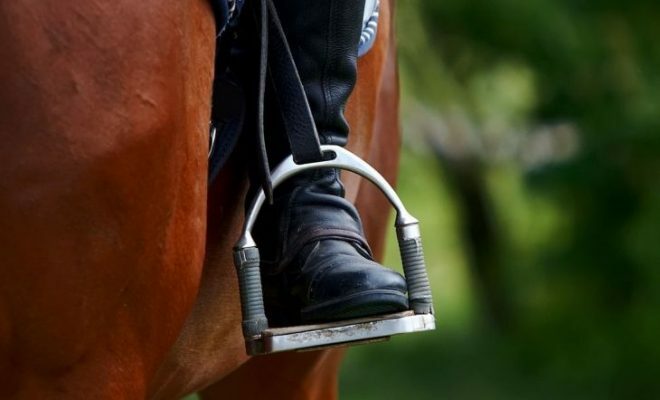 Keep both legs on equally and ride forward into an even rein contact down both reins. Check that your hands are carried at the same height with thumbs on top. Now, ride your horse forward. Keeping your horse straight in canter can be tricky. 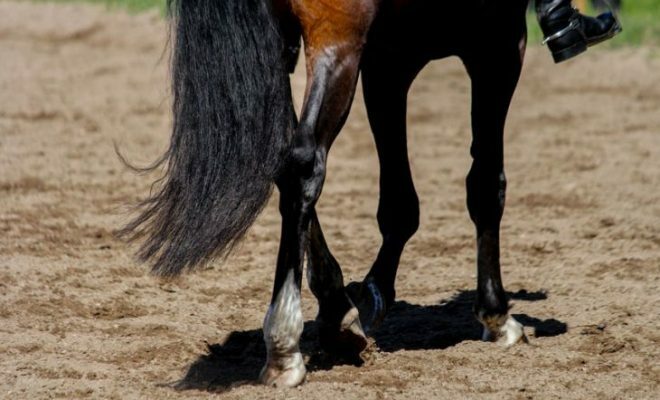 Horses that are unbalanced in the canter often compensate by bringing their quarters to the inside to avoid taking more weight on their hind legs. You can compensate for this by riding a half-halt and bringing your horse’s shoulders in very slightly from the track. This helps to keep the quarters out and stops the horse from becoming crooked. Straightness is ultimately achieved by making sure that the scales of rhythm, suppleness, contact and impulsion are in place. 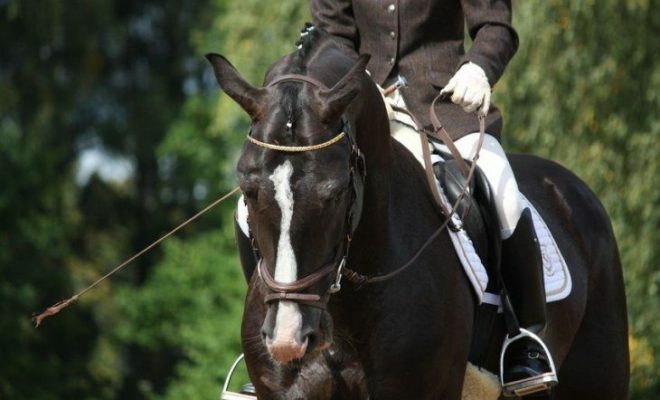 Remember that the slower the pace, the more likely it is that your horse will become crooked. Imagine if you tried to ride a bicycle very slowly in a straight line; the less speed you have, the more likely you are to wobble. Pedaling faster solves this instantly, and it’s the same with your horse.